The cover of my new chemistry course. If you have been reading my blog for a while, you might know that I recently wrote a new chemistry course. The publisher of my old chemistry course came out with a new edition, and they did not consult me. This happened with another course, and the result was excellent. However, the new edition of the chemistry course was riddled with errors. Many of the errors weren’t just typos or minor mistakes in the solutions to the problems. They were serious scientific errors that would put students at a disadvantage in their future studies. I asked the publisher to make my old chemistry course available for those who wanted to avoid such errors, but it refused. As a result, I wrote a new chemistry course, Discovering Design with Chemistry. I was recently asked on Facebook about the differences between my old chemistry course and my new one. While I have touched on that issue in a couple of other posts, I thought I would provide a thorough answer to that question here. I wrote Exploring Creation with Chemistry, 2nd Edition almost fifteen years ago. At the time, I honestly thought it was the best chemistry course available to home educators. Today, I still consider it an excellent course. However, changing times call for changing science courses. It’s not that any of the chemistry that the students learn in the course has changed over that time period, but the availability of certain resources has. Also, after nearly fifteen years of answering student questions, I was able to get a really good idea of how the course could be made better. 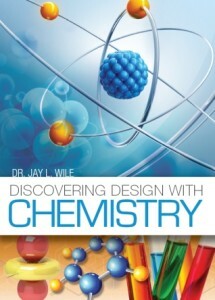 There are two major differences between Exploring Creation with Chemistry, 2nd Edition and Discovering Design with Chemistry. The most important one (in my opinion) is the difference in the laboratory component of the courses. The old course has some great experiments in it, but the new course has significantly superior ones. This is mainly due to the availability of a relatively inexpensive mass scale that is precise to 0.1 grams. In the old course, the mass scale was, at best, precise to only 2 grams. As a result, students couldn’t do any experiments that required measuring a small change in mass. However, with the availability of a scale that is 20 times more precise, students can do some very rigorous labs involving small mass changes. For example, there are chemicals called “hydrates” that incorporate water into their solid state. If you heat them, the water leaves, changing the color of the solid and reducing the mass. The mass change is small, but with the new scale, it is measurable, and students can actually determine how many molecules of water are incorporated into the solid for every molecule of hydrate. Experiments like these make the laboratory component of Discovering Design with Chemistry very similar to what the students would get in an academically-rigorous high school. There is another issue related to the experiments. Over time, the products available to the average consumer change. As a result, certain things that were “household items” when Exploring Creation with Chemistry, 2nd Edition was written are not easily found today. It is getting harder and harder to find lye, for example, which is an important chemical in a few experiments in the old course. It is nearly impossible to find toilet bowl cleaner that doesn’t cling to the bowl, but that is also an important component in one of experiments found in the old course. The “household items” that you need for Discovering Design with Chemistry are currently easy to find. Anything that isn’t easy to find is in the experiment supplies kit that has been made for the course. The other major difference between the two courses is the order of topics. Over the years, I could see that some students got frustrated in the second module of Exploring Creation with Chemistry, 2nd Edition, because it uses some detailed algebra. It only uses skills from algebra 1, but the idea of applying algebra to a science course is foreign to many students, so that made the module difficult. With the new order of topics, mathematics is applied in a much more gradual fashion. As a result, the material found in Module 2 of Exploring Creation with Chemistry, 2nd Edition isn’t found until Chapter 13 of Discovering Design with Chemistry. This allows students to get used to the idea of applying mathematics to chemistry before they reach the detailed algebra applications. There are some other, minor differences between the courses as well. Because I have been writing a historically-based elementary science course, I have learned more about the history of chemistry. As a result, there are more discussions about the famous chemists who developed the chemistry that the students are studying. Where appropriate, I highlight the Christian faith of those chemists. However, I never introduce scientists just because they are Christians. I discuss them because they relate directly to the chemistry that the students are studying. Finally, there is a bit more “whimsy” in this book. Over the years, students have commented about how they enjoyed the humor that I have put in some of my courses. As a result, I decided to add a bit more humor without detracting from the chemistry that is being taught. For example, I got creative with some of the chapter titles (What’s the Matter? ), section titles (Mass Conservation: It’s Not Just a Good Idea, It’s the Law! ), and experiment titles (Cool It!). While Exploring Creation with Chemistry, 2nd Edition is still an excellent course for home educators, Discovering Design with Chemistry is clearly superior. Dr. Wile, I cannot tell you how much I appreciate your willingness to adapt and improve with time without compromising the things that matter. Also, recently did titration experiment with son #3, and son #2, college grad, was surprised that I still have purple cabbage indicator frozen from when son #1 had chemistry, 11 years ago. The indicator still works, has lasted for all 3 sons. That is in the old book. I have been using that acronym since I taught at the university level more than 20 years ago! Thanks so much for telling me about the indicator working after 11 years! I thought freezing would destroy the anthocyanins, since they are pretty complex molecules. Obviously, it doesn’t. You’re welcome. Son #2, the chem grad, said the frozen indicator worked great, but had a funky, frozen food smell. Will you be working on an advanced text to follow this one oor will the Apologia one be adequate? Right now, the Apologia one is adequate. If they change it, I will write a review of it and indicate whether or not the new one is adequate. Hi Dr. Wile – I have sure enjoyed teaching science using your textbooks the past few years. Thanks, David. I saw the press coverage but have not had time to read the paper in Phys Rev Letters. I am sure I will blog about it once I get the chance. We have enjoyed your textbooks for the past few years. I would really like to try your new Chemistry text. Do you have an audio book companion like your previous Exploring Creation texts? We have used the audio companions with General science, Physical science and Biology. My girls are auditory learners. Thanks! Wen don’t have an audio companion for the book. However, we will have an audio version of the book available in the summer. It will be a recording of my wife reading the book. In addition, there is a content-rich website that has mostly videos. You can see that here. Just click on the links related to a chapter, and you will see videos that explain pretty much every concept covered in the course. Thank you Dr. Wile! We look forward to the audio version of your book! Thank you so much for caring enough to write a new chemistry book! We have been struggling so much with the second module of the Apologia 2nd ed. and yesterday I stumbled across a reference to your website during an unrelated search, and now I just found this post! We are ditching our current book and ordering your new one tomorrow!! Thank you. We have so enjoyed your other Apologia texts we have used so far. I hope the new book works better for you, Karen. Be sure to check the course website as well, because there are a lot of videos that explain things there. Also, be sure to use the question/answer service discussed in the introduction to the book.